New Jersey gets a bad rap, but there are lots of great things about living here. I hope to dedicate a post to New Jersey eventually. For now, know that one great thing about The Garden State is its proximity to New York City. These pictures were taken from the waiting room of a doctor’s office in Jersey City, which is right across the river from the city. 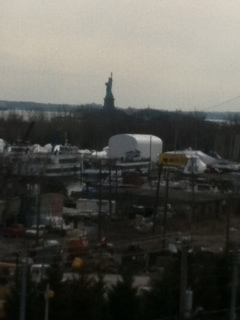 It’s pretty cool to be able to look out a random window and see the Statue of Liberty and the site of the new Towers. I wasn’t expecting to be able to see these places from my friend’s doctor’s office, but glanced out the window and there they were. Just thought I’d share. Also, I almost let the weekend go by without mentioning the Oscars tonight! Besides the movies I have posted about (Les Mis, Zero Dark Thirty, Life of Pi, and Beasts of the Southern Wild, as well as Anita’s post about Amour), I did get to see Argo and The Silver Linings Playbook. I just didn’t plan my posting schedule well-enough to find time to post about them prior to tonight. As you can imagine, they were both awesomesauce. So in total, of the nine movies I was able to watch six. Not too bad! I will be anxious to see what wins Best Picture tonight. My guess is Lincoln, since I didn’t see that one! Thanks, Andy! I am enjoying your writing on your blog. Look forward to more posts. Dan Day Lewis and Sally Fields in the same flick? Sure winner! Did you see it? I have a feeling it’s going to be the winner. Have a fun night! Haven’t seen it yet..I hate crowds so waiting for the DVD. Good plan. It’s always nice to watch a movie (especially a long one) from the comfort of home. Can’t wait for the Academy Awards! Cant’ wait to hear Seth MC. Let me know tomorrow what you thought! Have a great night. I love New Jersey. But I do wish there was better road signage. It’s like everyone here already knows where they are going or if they don’t they can’t figure out how to leave. When we moved here from Manhattan I was shocked by how much i liked it. Ha! That’s funny about the signage, because when I moved to central Jersey from north Jersey, I was given directions like, “Take the Giovi’s jughandle.” The what?? Or “turn at the tree in the middle of the road.” Um, okay?? I’m glad you like it, having come from Manhattan. 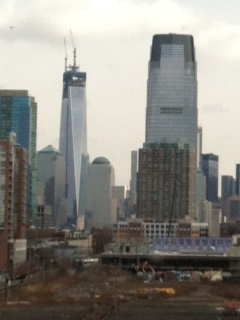 I have never been to USA but I’ve watched enough American shows about NJ especially in comparison to NYC. I love the red carpet pics myself. I will spend some time today checking out the dresses on line. Have a good day! I remember visiting New Jersey a few years ago. From what I remember, I enjoyed it very much. It reminded me of where I grew up in Little Italy, Toronto. I remember also seeing the contrast between New York City and the town, where, at the time, I felt New York was way more developed. But things may have changed since my last visit and I’ll always love my visit to New Jersey. I hope to get back there someday! Hopefully the shore will be rebuilt and in a few summers, it will be worth a trip to Jersey to visit the beach. I didn’t realize Toronto had a Little Italy. Is that actually the name of a town, or is it a section like in NYC? Interesting. Yup. It’s more of an area rather than a town. Little Italy spans several blocks in Toronto and it’s the heart of where the Italian festivities takes place whenever Italy wins a World Cup game. The whole area tends to close and the red, white and green gets waved everywhere. Crazy, really! Agreed about ZDT. Thinking about Bert M. makes me smile- remember during his Bucket List when he acted out a Bert Macklin scene and bashed through his glass door? That got me to thinking about when he acted out Roadhouse and Rambo. Great Andy awesomesauce moments! Enjoy Florida! You’re right – Jersey does get a bad rap. But you guys pay less for gas than we do – and we have to pump it ourselves. AND your highways have a truck lane. Brilliant. True! I will have to add those points to my jersey post, if I ever write it. Truck lanes are brilliant!! From out here, where New Jersey is just a legend told to children (causing them to roll their eyes and imagine they were adopted), I think New Jersey’s reputation is hurt by being almost NYC or almost Philly. I’ll wait while you laugh at my naivete. I know it’s possible to impress us outsiders with buildings and beaches, but what do you treasure? For example, here in Colorado, I could regale you about mountains, but really, for me, I treasure the way it feels, the sense of space, the feeling of the air, the sounds (or lack thereof), all things that don’t easily wow the rubes like mountains do. What is it in NJ that does that to you? From my years of surfing in contests, the few in Jersey were favorites for my friends and I. The people in Belmar are great and have always treated us like family. I think people think of New Jersey as Newark or Atlantic City. There is a lot of open country and the houses along Spring Lake Hill are incredible. The state needs a new marketing campaign…the winter weather I could do without though. You are right. A new marketing campaign (besides our overweight, aggressive Governor) is a must for N.J. The winter weather is a pain, but in recent years it has been pretty mild. I’m glad you had a good experience here and found things to enjoy about our state. Thanks for reading!